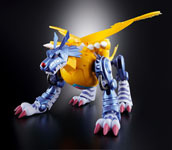 The second revival of the Digivolving series features: Metal Garurumon! 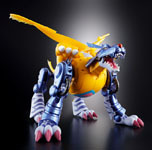 The cute Gabumon evolves into this wolf based Digimon effortlessly in this figure, which infuses metal parts with plastic parts for your playing enjoyment. A very nice addition for Digimon lovers, enjoy it today!